#Red4Ed earned plenty of headlines this spring. Did it yield election wins for Democrats in the fall? Democrats enjoyed a strong Election Night, romping to record House gains. At the state level, where most education policy is decided, the party picked up some key governor’s races — but did they maximize the opportunity? The most recent chapter in American education policy began eight years ago, after the 2010 midterm elections. That year’s Tea Party wave, fueled by conservative backlash to the still-young Obama administration, swamped Democratic-held statehouses in Michigan, Wisconsin, New Mexico, Kansas, Maine, and elsewhere, and led to the passage of a raft of ambitious changes to education policy. Eleven states passed laws either establishing or expanding voucher programs and education savings accounts (ESAs) in the first six months of 2011. Many of the same new governors acted swiftly to restrict public-employee unions. And partly due to cash flow problems in the depths of the Great Recession, most states began cutting state aid to schools. Eight years later, we have arrived at something of a reversal: After a spring awakening of teacher strikes, the 2018 midterms have delivered Democrats the U.S. House of Representatives and seven new governorships — including in Michigan, Wisconsin, New Mexico, Kansas, and Maine. 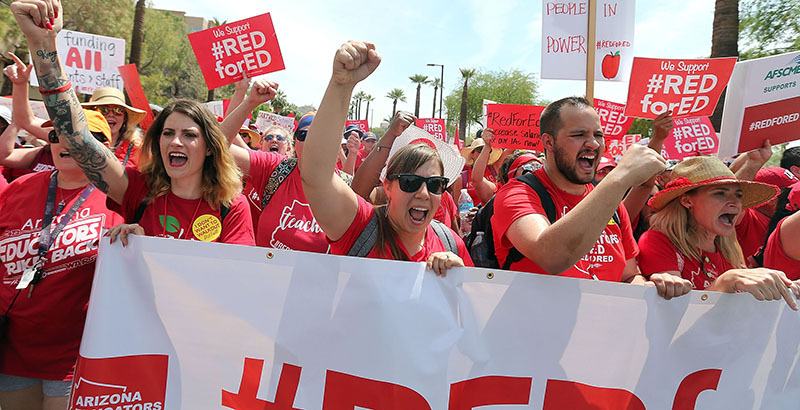 For observers of education and politics alike, the key questions are these: How did the #Red4Ed movement, with its swarms of T-shirted educators organizing over school funding and teacher pay, influence this year’s historic election results? And with the mini-epoch of conservative reform fading, in which direction will Democratic officeholders move policy? 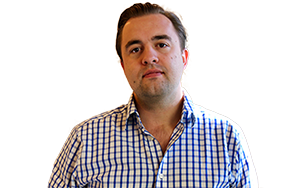 As with most election cycles, results from diverse regional electorates can be ambiguous and sometimes completely contradictory. Wisconsin Gov. Scott Walker, considered Public Enemy No. 1 by teachers unions, was narrowly felled by a Democratic superintendent of schools. Democrats also swept into power in neighboring Michigan and — most surprising of all — Kansas, where fierce battles over education funding drove former governor Sam Brownback’s approval ratings into the ground. But voters in Oklahoma, home to some of the most bitter teachers strikes this year, favored Republican Kevin Stitt by a wide margin. The paradoxes were apparent even within states. Arizonans comfortably re-elected Republican Gov. Doug Ducey, who tangled with striking teachers before approving a sizable raise; at the same time, they heartily rejected a ballot referendum to expand ESAs, a signal Republican priority. Coloradans elevated Governor-elect Jared Polis, a Democrat who has called for higher education revenues, even as they defeated an initiative to tax high earners to raise those very revenues. Ultimately, Democratic governors will not be empowered to implement their favored progressive education policies — many championed higher spending, especially to expand state-funded pre-K programs, as well as limitations on charter schools and voucher programs — in the same way their Republicans predecessors were after 2010. Moreover, the vaunted class of teacher-candidates who sought state and local office were largely unsuccessful. Even as education helped to turn the tide in a few major races this fall, some local experts said that it was hard to identify how big a role the issue played. Jon Shelton, a professor of history at the University of Wisconsin–Green Bay, said that Scott Walker’s defeat may have owed as much to the governor’s troubled bid to woo electronics giant Foxconn as to his reputation as a foe of teachers unions. Originally intended to bolster the governor’s reputation as a steward of jobs, the optics of the deal quickly curdled within the state. Still, he added, circumstances in particular states may have made the fate of schools seem more pressing. In Kansas, where budget shortfalls have made four-day school weeks a common occurrence, some of the country’s most conservative voters gave their support to Democrat Laura Kelly. Local political conditions, such as a given state’s typical partisan bent, made certain areas a tougher lift than others. In purple Wisconsin, an education debate helped unseat Scott Walker. But in red Arizona and Oklahoma, Republicans easily dispatched their opponents. Still, Democrats saw opportunities in states that have rarely been competitive for them. According to longtime Arizona pollster and political observer Mike O’Neil, Gov. Ducey’s victory could have gone the other way had he not deftly negotiated his state’s teacher strike this April. After initially fighting the union’s demands, Ducey backtracked and promised a multiyear, 20 percent raise — one of the most generous salary hikes in the country. That volte-face likely helped take the wind out of the protest movement’s sails. He noted that Democrats made important gains in the state apart from the governor’s race, picking up several seats in the state House and Senate. Though the outcome is still to be decided, Democrat Kathy Hoffman has declared victory over her Republican opponent in the ultra-close state superintendent’s race. O’Neil also believes that a referendum to raise taxes for school aid, which was headed for the ballot before being controversially sidelined by the state Supreme Court, stood a good chance of being approved. The principal obstacle, Arizona’s native red tendencies, was also apparent in states like Ohio, Iowa, South Dakota, and Oklahoma, where some high-profile Democratic candidates fell short of the mark. But even in states where the the party broke through, victorious candidates won’t always have total freedom to work their will. In Nevada, New Mexico, and Maine, Governor-elects Steve Sisolak, Michelle Lujan Grisham, and Janet Mills will benefit from Democratic control in their state legislatures. But Michigan’s Gretchen Whitmer, much like Wisconsin’s Evers and Kansas’s Kelly, will have to forge tough deals with very conservative Republican majorities that have been locked in, at least in part through partisan gerrymandering. That will undoubtedly pare back their ambitions. Michael Hartney, a politics professor at Boston College, said in an interview that he thought #Red4Ed had earned some important victories in spite of the incomplete success at flipping governorships. Now the focus turns to the future. Teachers marching under the banner of #Red4Ed have won a few victories, both at the negotiating table and the ballot box. They’ve also seen the limits of grassroots organizing. In Arizona, where the ESA referendum was crushed last Tuesday, the still-Republican state legislators are already discussing paths to an expansion on the statehouse floor. With the bright lights turned instead to the upcoming 2020 presidential election, it’s anyone’s guess whether teachers will be prepared to beat the sidewalks again.